The CSI6243 Digital Capacitance and Inductance Tester features a large 3.5 digit LCD display and 10 total ranges (6 ranges for capacitors and 4 ranges for inductors). Also supplied with OSHA yellow rubber holster and safety design test leads. Highly accurate with Auto-Zero adjust and overload indication. 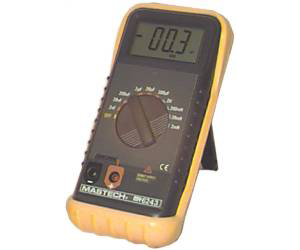 A very handy piece of test equipment for general trouble shooting and component testing.